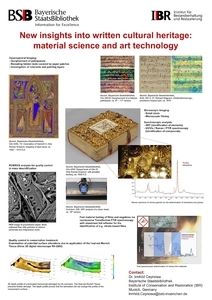 CEYNOWA, Irmhild (2018) New insights into written cultural heritage: material science and art technology. Paper presented at: IFLA WLIC 2018 – Kuala Lumpur, Malaysia – Transform Libraries, Transform Societies in Session 153 - Poster Session. 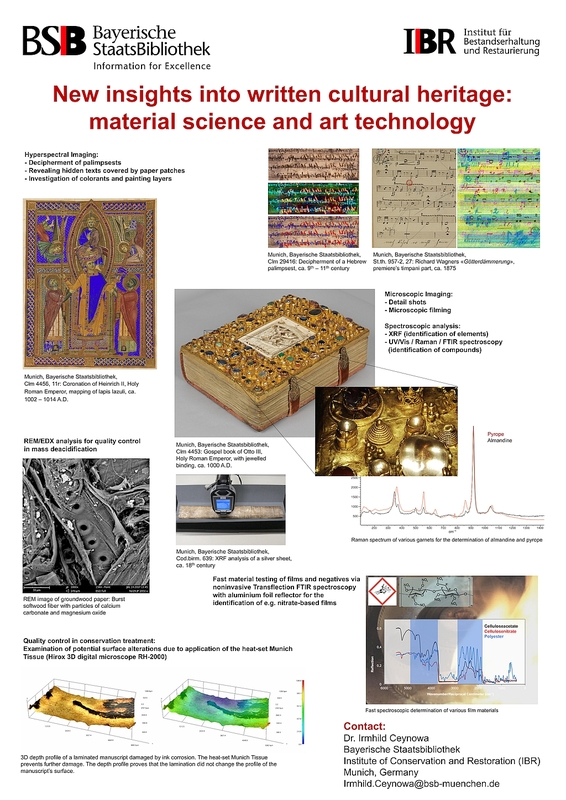 In view of its outstanding rich and high-quality collections and the growing interest in material analysis of cultural heritage in the research community as well as in public, the Bavarian State Library has entered the field of material science and art technology. Being the first German library equipped with state-of-the-art technology, the goal is to actively support and shape national and international cooperation projects. The poster provides an overview of selected results of 3D digital microscopy and spectroscopic analysis from research projects. The goal is to combine digital images e.g. of cover, text and miniature paintings with in-depth analytic data on the material composition. The Library has taken a pioneering step towards Open Science pursuing the strategy of directly linking primary research data on written cultural heritage to the study object and making it available online. This is made possible by significant advances in viewer technologies under the IIIF community and with the new Mirador viewer. Scientists, students, and the public may access all research data in one place and gain insight into the emergence of scientific results. By providing them as open data, they are a readily available source for further research worldwide.